I’m a fan of authentic communication and storytelling that builds upon the history, culture or identity of a company. Four years ago, I wrote on this blog about Air Malta’s inflight safety movie. The post, titled “the knight on the plane”, described how the airline operator’s video capitalized on the Maltese Islands’ rich history and their famous Knights. Today, I am writing this new post on a plane flying from Singapore to Perth. I’m not a frequent traveler anymore in that part of the sky (though my CO2 footprint is already big enough to become a non-honorary member of the flygskam movement) but Singapore Airlines is still one of my favorite carriers. Because of its impeccable service – even in economy class – and, I admit, its elegant female cabin crew. Earlier tonight, I was really charmed by the airline’s safety briefing video. The movie, produced in partnership with Singapore’s tourism board, iterates the various passenger safety instructions and projects them onto scenes of daily life in the city-state. The beautiful images, of which not a single one has been taken inside an airplane cabin, manage to achieve one of the hardest communication challenges: making your audience listen to a set of boring instructions (which some passengers may have heard a gazillion times before) and keeping their undivided attention. Already in 2015, I wrote a blog post about the five elements of a story. Almost all novelists and movie directors rely upon character, setting, plot, theme, and style to ensure a consistent story, allow the action to develop and let the audience emotionally engage. A few days ago, a tweet by Dutch mathematician and science communication professor Ionica Smeets brought a video under my attention with a lecture about the shape of stories. The presentation is given by the American writer Kurt Vonnegut (1922-1977), probably best known for his controversial – the book was banned in various US libraries and schools – anti-war novel Slaughterhouse-Five. A graduate student in anthropology at the University of Chicago from 1945 to 1947, Vonnegut’s master thesis about “The Fluctuations Between Good and Evil in Simple Tasks” was rejected because it was so simple and looked like too much fun (as he wrote in his autobiography “Palm Sunday”). In this brilliantly funny talk, the writer draws a graph on which any story can be plotted. The vertical axis represents the good and ill fortune the characters experience, while the horizontal axis represents the timeline from the beginning to the end of a story. For those interested (or provoked, surprised or intrigued), there’s also a recording or a longer version of the lecture on YouTube. Just as I have done for the past 10 years, I spent the last week of February at the Mobile World Congress in Barcelona. Four long days in a row representing my company, talking to customers, demonstrating exciting new technologies, and telling the same story ad infinitum. To my feeling, at least a few hundred times. The team started with the preparation of this monster event (see the list of earlier blog posts that I have written about MWC at the bottom of this page) months ago. We invested hours and hours in creating our pitch, elaborating our story, and preparing our demo. We built message houses, crafted storyboards and wrote scenarios. And we went through many dry run sessions. After having returned from Barcelona, I can only observe and conclude that what I told the booth visitors on day 4 was completely different from the story we prepared for day 1, and from what we had rehearsed so many times. Actually, each time I gave our demo, my narrative sounded more balanced and seemed to be much more appreciated by the audience. So, why didn’t we think of this particular detail or include that specific use case already months ago? Well, because repeating your story in front of a real-life audience is so much different from rehearsing it in front of your direct colleagues or giving a virtual sales briefing via a conference call. 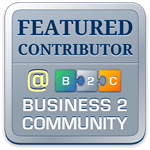 Each time I presented the demo – live! – to yet another customer group the messaging became more stable, more fluent and more sophisticated. Yes, I’m the guy on the picture below with the blue Nokia shirt and the (high-tech, though silly looking) brainwave-sensing headband. While delivering my pitch, I discovered what worked and what didn’t. Being able to experience the body language and getting feedback signals from your listeners at a meter’s distance is what really made – and makes – the difference. It’s really not about what you prepared or rehearsed, but about how you deliver your story. And about how your customers react to it. And about the face-to-face Q&A and discussions you have with them afterwards. So, what’s the use of going through a long preparation and rehearsal process and what’s the sense of doing dry-runs, if after only one day at the Fira you’re delivering a completely different and better demo than the one you arranged for? And is all this preparation effort then really a waste of time? Certainly not. Any good public speech starts with knowing your audience, defining your pitch, building your storyboard, and creating your presentation. I’ve explained this in my post about the 3 p’s of a professional public presenter. All this upfront activity is useful, needed and necessary. But, at the end of the day the proof of the pudding is in the eating – by the people who came to your booth. And their reactions on our latest Barcelona demo have been great! Fortunately the girl could also tell us that one of the pieces was Italian, blue, and that we had to pay 5 euros extra because we had the cheese platter instead of the dessert. The cheeses tasted fine (actually the blue variety turned out to be dolomitico), and although I hadn’t expected the full Monty Python’s cheese shop sketch, I felt like I had missed some essential information and paid for some undefined items. When presenting technical or even non-technical matters to your audience, they often like to hear the tasty details. Well, sometimes even the cheesy ones. Because, that’s exactly what we do each New Year’s Eve. At our home, we even keep the champagne cork as a souvenir for the future. 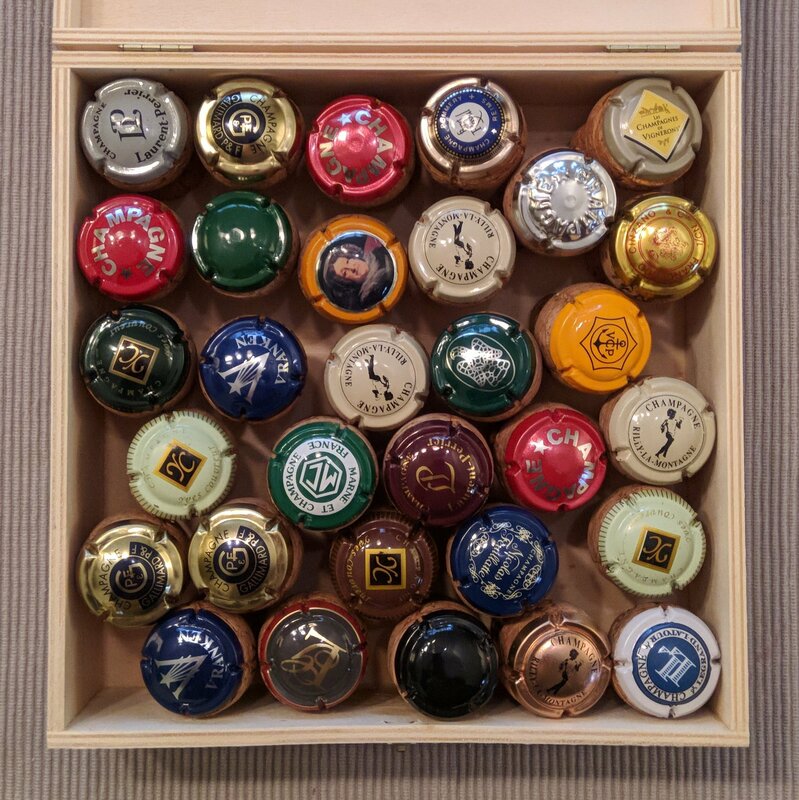 As such, my family has already gathered a few dozens of corks, cherishing memories of past New Years, anniversaries and life events. Precious keepsakes of our wedding day, my wife’s first positive pregnancy test, or the birth of our children – just to name a few. Predicting, awakening, or even shaping the future is never easy. I don’t want to make any statement about whether the past was better than the present. Or whether the future looks gloomier than, say, 10, 20, or 60 years ago. We’re living in a different era today, with a different zeitgeist, and with different challenges. Though I must admit that I’m not too excited about some of today’s (geo)political, economic and social evolutions, the world may be in a much better state than we often assume. At least, that’s the message I retained after reading “Factfulness” by Hans Rosling. The book, subtitled “Ten reasons we’re wrong about the world, and why things are better than you think,” is the perfect antidote to negativism. Diving into statistical data of over 80 global trends, like population growth, poverty, girls’ education and child mortality, it shows us the positive changes that have taken place over the past years. If you haven’t read the book in 2018 yet, it’s recommended reading for 2019! So, I keep looking at the bright side of life. As the late Leonard Cohen sang: “There is a crack in everything; that’s how the light gets in.” Let’s be positive about the future. Let’s think opportunities and not challenges. And while valuing the corks of the empty bottles, always make sure there’s a full bottle of bubbles in the fridge! Here’s a small new year’s gift: a checklist that will help you deal with your next presentation challenge. A booklet that addresses the 3 P’s of a public presenter: your pitch, your preparation and your presentation. It summarizes the tips and tricks I wrote about on this blog, and it gives you templates for building a message house, mapping your audience, calculating the number of slides you need, anticipating Q&A, and much more. Download the PDF version of your Pocket Presentation Planner now. Right-click the image above, save the linked file and send it to your printer. Happy holidays, happy reading, and happy presenting! To me, projecting an over-capitalized slide is similar to using pluralis majestatis, a.k.a. the royal we. It’s like speaking formal language rather than prose. It may (or may not) make a presenter look more important, but it will never camouflage bad content or a lack of presentation skills. The situation becomes even worse when people start capitalizing all words in bullet points or isolated words in the middle of a plain text (unless you’re writing in German, of course). And I even don’t want to think of people who use ALL CAPS on their slides (or in their tweets) If Capitalizing Words Is Like Using The Royal We, then WRITING IN ALL CAPS IS LIKE SHOUTING AT YOUR AUDIENCE. So please use the shift key sparsely and thoughtfully. Always be consistent in your style: don’t feed the chameleons. Vary your slide templates and avoid wordy texts or long bullet lists. As I mentioned in an earlier post on this blog, full-sentence assertions are often better than short catchy or meaningless headlines. And, remember that it’s sometimes also good to use a plain graphics slide with no header text at all. If you’re a frequent reader of my blog, you also know that I like travelling – city tripping as well as nature hiking. While making this photo trip down memory lane, I rediscovered the roads I walked along and the places I visited before. And, I identified creative opportunities to combine the power of an authentic picture with a sharp message into an inspirational visual. Below are my three favorite creations (click on the pictures to enlarge). 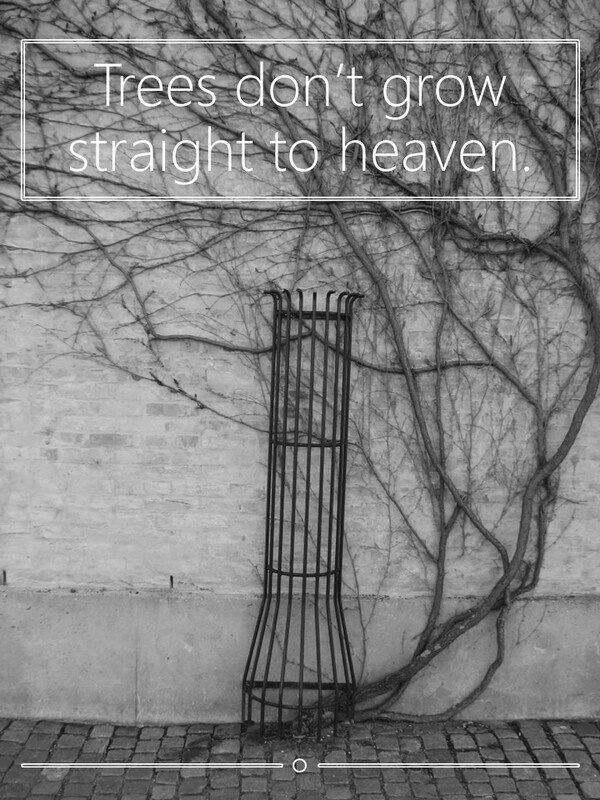 My second photo features a popular (though anonymous) Wall Street expression: “Trees don’t grow straight to heaven.” It articulates that stock markets are volatile. Or, more general, that there are no wins without losses. No gains without pain. The picture dates from 2016, when my wife and I were on a city trip in Copenhagen. No need to explain the origin of this third quote. Everybody knows the Lennon & McCartney song I borrowed it from. There’s no need to explain the meaning of the words either. Or to tell you why they are inspirational. 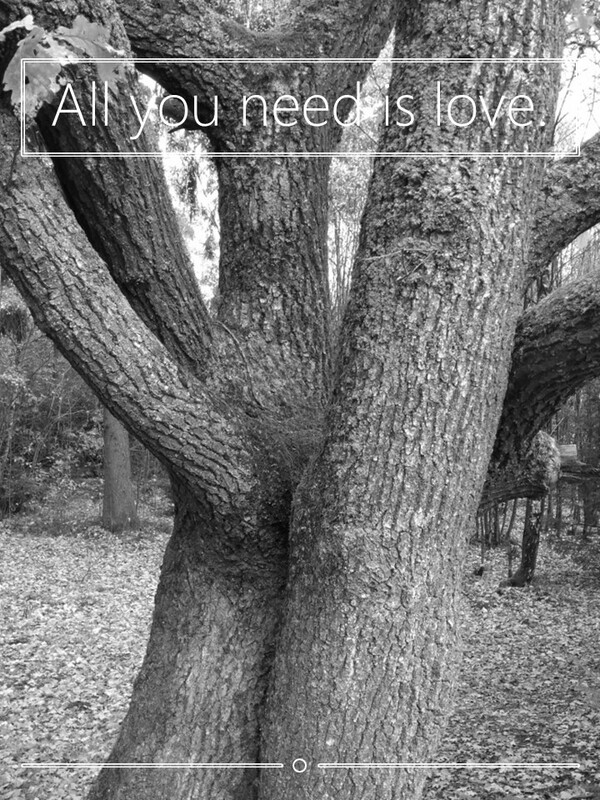 “All you need is love, love, love is all you need.” We ran into this couple of kissing trees in the woods of the beautiful Belgian Eifel region, near the town of Sankt Vith. And my humble camera phone did the rest. Feel free to reuse my artwork in your presentations. Or stick the posters on your office or bedroom wall. A widely quoted Microsoft study from 2015 tried to tell the world that the time an average person is able to concentrate on a particular subject has fallen to 8 (eight!) seconds. Which is less than the average attention span of a goldfish. Although the goldfish comparison has been recited by many media and has been (mis)used by marketers to reduce their outreach to twitter-style messaging, it makes little sense – IMHO even no sense at all. Because the world of a goldfish ends at the rim of the glass bowl it’s floating in. 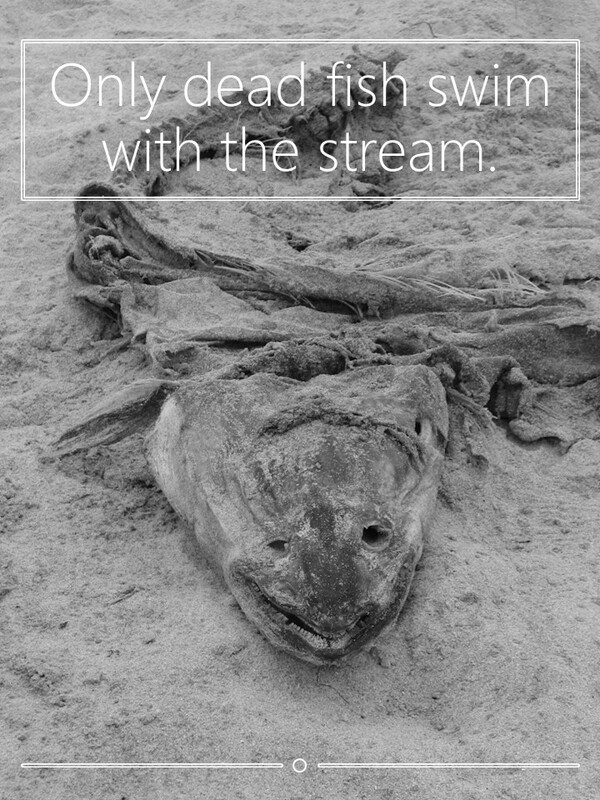 Your audience aren’t carp. They are real people with unmet needs and innate curiosity. I know no single business person that would be satisfied with only 140-character content or an eight-second presentation. My personal experience as a public speaker actually tells me that you’ve got at least 15 to 20 minutes before you start losing (some) people’s interest. A number that resonates with the ’20’ figure in Guy Kawasaki’s 10/20/30 rule of PowerPoint. On the other hand, as observed by Nobel prize and Turing award winner Herbert Simon: “A wealth of information creates a poverty of attention.” It’s not the number of slides or the detail of the content that determines their attentiveness to your audience. Human interest and attention span are determined by their daily problems, their current mood, and the persuasive power of the presenter. Nearly 9 respondents out of 10 to a Prezi survey acknowledged that a strong narrative and the story behind what’s being presented are critical in maintaining engagement. Pause a few seconds before showing a slide or presenting a key message, to create a sense of anticipation. Pause right after a key point to allow it to sink in. Change the speaker. If you really have so many important things to tell, just consider bringing a colleague to offload part of your speech to. tl;dr is internet slang for too long; didn’t read. It’s often used on online discussion forums or in the comments section of an article to say that some text was ignored because of its length. A less diplomatic definition on urbandictionary.com suggests that the acronym is frequently used by lazy, ignorant people, when something exceeds their ability to read or when they lack the semantic capacity to comprehend or respond to a post. The title of this blog post, tl;dl, is a variant to the above letterword, and stands for too long; didn’t listen. If you don’t want your listeners to be goldfish, you’d better make sure that your presentations are not tl;dl. Make sure that your presentation is to the point, that your words are worth listening to, and that you present with passion and persuasion.